More than half of olive oil users agree that choosing an olive oil is confusing because they aren't sure of olive oil benefits, terminology, and uses. In fact, only 25% say they are "very knowledgeable" about olive oil, according to a new study conducted by the North American Olive Oil Association (NAOOA) of more than 2,000 olive oil users. Currently, only 4 in 10 US consumers use olive oil, accounting for about 15% of the retail volume sales compared with other cooking oils. The NAOOA is sharing its findings, tips on how to help consumers increase their olive oil knowledge, and reminding health experts gathered at the American Academy of Nutrition and Dietetics annual Food & Nutrition Conference and Expo in Atlanta of the mounting evidence of olive oil's health benefits. "There remains a lot of work to be done to help make olive oil a mainstay in kitchens across the US," says Eryn Balch, executive vice president of the North American Olive Oil Association in Neptune, New Jersey. "The nation's top food and nutrition experts have embraced the health messages about olive oil already. Now we hope they'll be a key part of addressing consumer confusion, debunking myths, and fostering a better understanding of olive oil's taste, versatility, and well-documented health benefits." Several myths around olive oils persist, including recent headlines touting new testing standards for olive oils produced specifically in California which lack scientific rigor and confuse consumers. The NAOOA has long been leading the charge for uniform and scientifically sound olive oil testing to benefit all producers and assure consumers of authentic, quality olive oil. The NAOOA petitioned the Food and Drug Administration (FDA) and supported recently updated USDA standards. It continues to collect hundreds of samples directly from store shelves each year for full purity testing at independent laboratories certified by the International Olive Council (IOC), the leading global authority on olive oil research and standards. The California Department of Food and Agriculture (CDFA) recently approved new standards on the labeling and grading of olive oil produced in the state. California producers are seeking to differentiate their products from imported olive oils which they say are often substandard, but according to the NAOOA, the California standards lack scientific rigor. These new standards rely heavily on taste testing, which has given inconsistent results and has been debated as a biased grading tool. They also don't include purity testing, a critical foundation for quality monitoring. And although the standards took effect on September 26, CDFA doesn't have an implementation plan in place. "We believe the health benefits of olive oil make it a great choice and are concerned that people are confused when there's been great strides made by so many in the food and nutrition community to change habits and perceptions of olive oil," said Sara Baer-Sinnott, president of Oldways, a Boston-based nonprofit inspiring good health through cultural food traditions and lifestyles. "We support NAOOA's efforts to improve knowledge and push for universal quality standards." "Our aim is to help food and nutrition experts do what they do best -- translate from the textbook to the table and debunk myths that persist, as well as be sure they are aware of new confusion from the distracting California regulations," explained Balch. Extra-virgin olive oil is the most flavorful olive oil, with an unlimited range of flavors spanning from smooth and subtle to peppery and pungent. A finishing drizzle of extra virgin olive oil can enhance the texture, taste, and aroma of food. Olive oil, sometimes referred to as "classic" or "pure" olive oil, has a milder flavor with just a hint of fruitiness. The subtle flavor of olive oil makes it perfect everyday cooking oil and easily adapts to a number of cooking methods such as grilling, sauteing, roasting, frying, and baking. Light-tasting olive oil is almost flavorless, bringing the benefits of olive oil to recipes without influencing the overall taste. Light-tasting olive oil is the perfect choice when looking for an oil that won't alter the flavor of a dish. Purchase bottle sizes to be used within 8 to 12 weeks of opening. Pay attention to labels and choose the type of olive oil that is best suited for the intended use. Choose a best-by-date that is as far out as possible. With proper handling, olive oil can keep in a sealed package for up to two years. Look for brands with a Global Quality/Authenticity Seal such as the NAOOA Quality Seal. Dark bottles or tins are best at reducing potential damage from light, especially for extra-virgin olive oil. Avoid packages that show signs of improper handling or storage such as dust on the bottle, broken or loose seal on the cap, or an orange tint to the oil which could indicate overexposure to fluorescent lighting and/or that heat has damaged the oil. Look for a country of origin statement, which is required by federal labeling laws and is typically found on the back label near the nutritional information. The beneficial role of olive oil in a healthy diet has been proven time and again in studies around the globe, and science related to olive oil's health benefits continues to evolve. 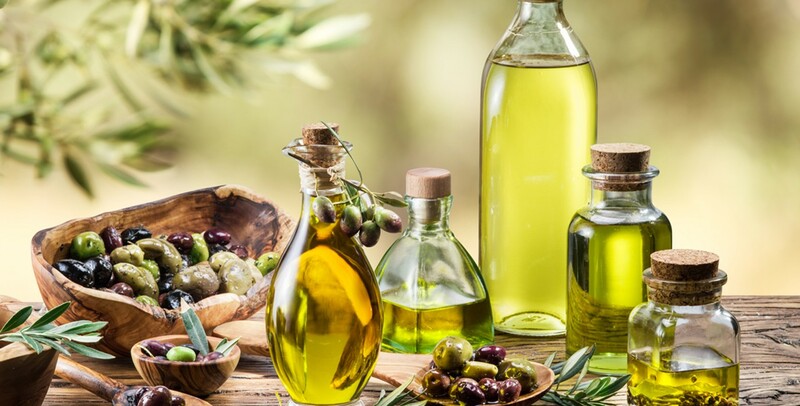 A diet with olive oil as a main source of fat has been linked to health benefits related to cardiovascular disease, diabetes, stroke, and cancer, among others. There is also evidence that olive oil helps the body better absorb beneficial nutrients from vegetables and other healthy ingredients in meals. The most important aspect of using olive oil for health purposes is to remember that it should replace sources of saturated fat in your diet. Olive oil is a more healthful choice than many other cooking fats because it is a monounsaturated, or "good," fat. Consuming monounsaturated fat in place of saturated fat has been shown to help lower the bad LDL cholesterol and raise the good HDL cholesterol. In support, the FDA approved a heart health claim for olive oil in 2004.